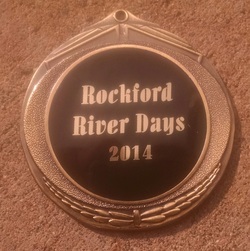 Check back daily for new clues to be posted the week prior to River Days weekend. Good luck to all participants! Clues will be posted each morning after 9 a.m.
- is always located within the Rockford city limits. - is never buried in the ground. - is always on public property. - is accessible 24 hours, BUT posted hours should be observed. - fits in the palm of a hand. Be safe & play nice! Participants who engage in any unsportsmanlike, distruptive or abusive behavior will be disqualified, at the discretion of the River Days Committee. Anyone who damages, destroys, or trespasses on public or private property will be disqualified from the contest. Participants must obey opening and closing hours of public parks. River Days Committee members and their immediate family members are not eligible to participate. When you find the medallion you must immediately call the number enclosed with the medallion; failure to do so will cause you to forfeit the $100 prize.